A hot air brush is a two or three-in-one product that can help make getting ready for work in the morning that much easier. Usually, it features a volumizer, dryer, straightener, and curler or mixes of all of them. The goal of the brush is to quickly add volume, style, and smoothness to your hair. It then wants to get rid of damage, add shine, and smooth out those frizzy strands. While owning a hot air brush can add so much convenience to your life, it can take a little research and due diligence to find one that impresses you. A quick skim through Amazon reviews will tell you that not everyone studies up on the best hot air brush for the money before going ahead with the purchase. Do you want a smile on your face when you use the brush for the first time? Then you need to be careful with what you choose. Consider the price, the features, and even the technology. Then, you may also want to think about the power, settings, and how comfortable the bristles appear to be. Choosing a hot air brush isn’t rocket science, but it can take research to find the best one. Check out these nine high-quality options below. Doing your hair in the morning can be an impossible task, but if you purchase this hot air brush from Revlon, you may find it’s easier than ever before. Instead of trying to add volume to your hair and smooth out wrinkles with a hairdryer and brush, you can get two products in one with this product. While brushing your hair with this hot air brush, you’re able to add hot air, smooth out those frizzy strands, then add a whole lot of volume. 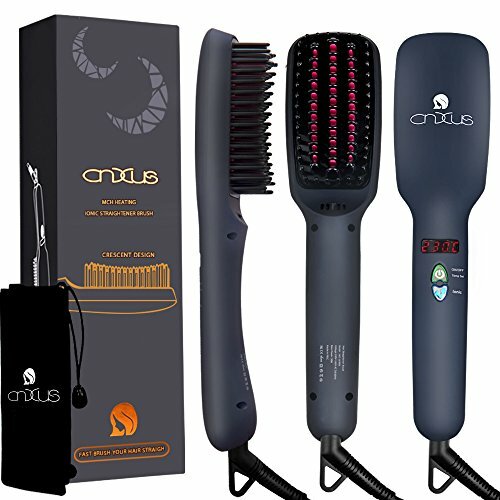 The oval brush design also helps to make it a far quicker process than what you would traditionally do, along with the nylon pin and tufted bristles to strike through tangles. The benefits of a hot air brush from Revlon don’t end there, however. You can buy this unit in either black or mint to suit your needs, and benefit from ionic technology to reduce frizzing, and two heat and speed settings. No matter what condition your hair is in, this brush will take care of it with no problems at all. 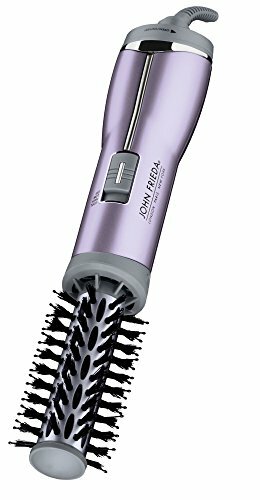 If you don’t want to spend the earth to have perfectly styled hair every morning, but you know you need something to help tame the mane, set your sights on a hot air brush from John Frieda. Reasonably priced on the market and available in a sleek, silver color, it’s going to tick all the boxes before you even use it. Then, when you do, there is a range of features that may capture your attention. It’s lightweight to stop you getting tired arms while you use it, while also offering a swivel cord too. As a result, you won’t always have to try to untangle it while you’re using it. When it comes to frizzy, matted, and tangled hair, it’s not a problem for this brush either. Thanks to frizz control, advanced ionic technology, and premium nylon and ball-tipped bristles, it will brush through your hair like a knife through hot butter. The resultant effect is smooth, volumized hair you will love. The sleek design, heat and cooling settings, and the addition of the 1.5-inch titanium ceramic barrel is sure to see you adding this hot air brush to your shopping cart. It’s worth a closer look. As an affordable, stylish hot air brush, this unit is going to attract a lot of people. However, while it’s an excellent product you will love for styling your hair, it’s important to remember that you pay less for fewer features. That’s the case with this hot air brush from PHOEBE. It’s going to get the job done, curling, straightening and combing your hair. It will also do it while promoting healthy locks, reducing frizz and heat damage, and making your hair beautifully smooth and shiny. However, this hot air brush lacks an automatic shut-off feature for safety, as well as flexible bristles and adjustable temperature. If you don’t mind styling your hair on the same temperature, then you will love this hot air brush and all its features. It’s affordable, a striking color, and is relatively compact for travel and other purposes. It’s not leading the market, but it’s also not dragging the chain. Want a hot air brush like the professionals, but without the price tag that usually goes with it? Check out this hot air brush from MHD Professional. While it looks the part with its nine-foot salon-style power cord with swivel and sleek black color scheme – it’s more than suitable for a home user. What’s more, it’s priced for one too. This hot air brush is one of the most affordable on the market, but you benefit from so many features. It’s powerful at 1000 watts, offers a hot air blow and volumizer option, and has two heat settings as well. Therefore, no matter what type of hair you have, this hot air brush will have it looking stunning in no time. It also uses ceramic and ionic technology for a frizz-free and shiny finish, all the while making sure you don’t damage your hair with the tourmaline and ceramic heating element. MHD Professional has done a lot to make sure this is a premium, affordable product. Therefore, you will find it’s well worth adding to your shopping list. Whether you’re on the road or like to have a hot air brush that’s compact and lightweight, then set your sights on this option from Wazor. It looks every bit the professional tool but is more ergonomic, comfortable to use, and compact. If the sleek black color, affordable price tag, and easy to use components weren’t enough to convince you of this hot air brush’s effectiveness, then the premium use of technology will. 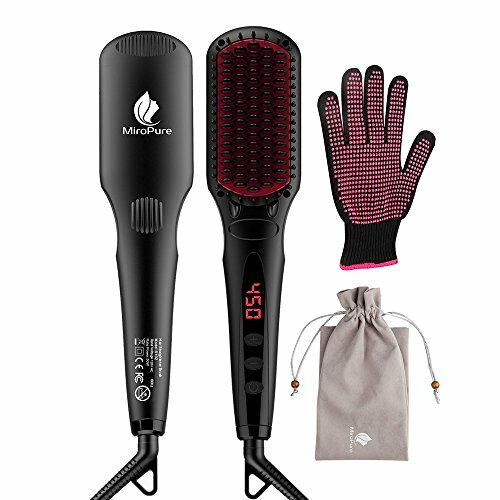 It features a ceramic tourmaline-coated barrel, ionic technology to promote a frizz-free and shiny finish, and two speed settings. Therefore, you can match the configuration to your hair for a better chance of success. What you will also love about this hot air brush is how it’s a one-step machine. You don’t have to worry about drying your hair with something else then finishing it off with this product. Your new hot air brush from Wazor takes care of everything – while being priced more affordable than most other options on the market. Even though this hot air brush from MILUSH is a little more expensive than other models on the market, you will quickly discover why – and you’ll suddenly be okay with it. If you get more features, as is the case with this hot air brush, you won’t care about having to spend a little more! 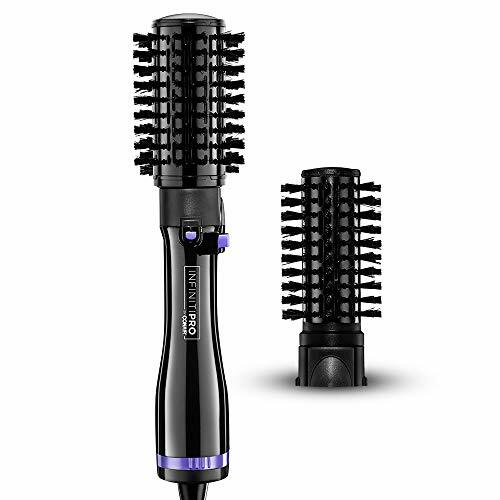 This striking unit has three-in-one functionality, will volumize and dry your hair, and even has multi-directional rotating actions. What’s more, it won’t cause static, prevents and removes tangles, and has gentle nylon bristles instead of hard, scratchy ones. When it comes to settings, this hot air brush has many of them! You can choose from two rotational settings, two heat, and one for cooling. It then uses its large barrel and tourmaline ionic technology to create a sleek, shiny, and premium look that many other hot air brushes on the market can’t achieve. If you have short or medium-length hair, then take a look at this hot air brush from Sanwin. Even if you didn’t think you needed a product to add volume and style to your hair, you will once you take a closer look at what this hot air brush has to offer. With one-step functionality and a three-in-one design, it offers you everything you need to head out on the town looking suave. It will take care of tangles and frizz, all the while adding volume to last a long time. This hot air brush also has the ionic technology for a healthy shine and is far more comfortable to use than some other models thanks to its oval brush design. 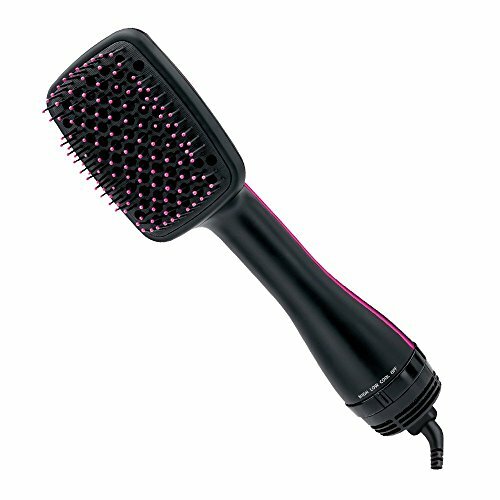 Then, with the addition of the nylon pin and tufted bristles, it’s also gentle and forgiving on your scalp. However, if you’re on a budget, this hot air brush may not be for you. It’s costly – even if it’s well made – and it’s also quite heavy and large to use. You may also find this hot air brush is not for you if you don’t have short or medium-length hair. 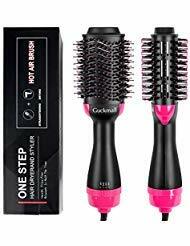 If you prefer to use a hair dryer and brush instead of a hot air brush, then you will enjoy what this professional round brush from Osensia has to offer. Working seamlessly with your drying appliance, it’s packed full of features to make your entire styling process go smoothly. 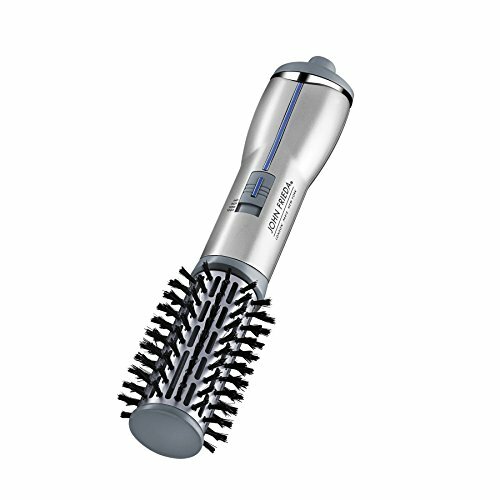 It features a ceramic ion thermal barrel in four different lengths, and this barrel also comes with anti-static mineral-infused bristles. As a result, you benefit from a far more seamless styling process than if you were to use a regular brush. 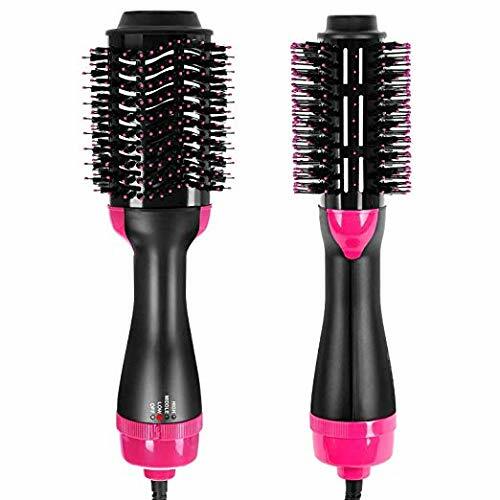 What you will also enjoy about this brush is that it’s comfortable to hold and use, has a convenient and ergonomic design, and the bristles are gentle on your scalp. 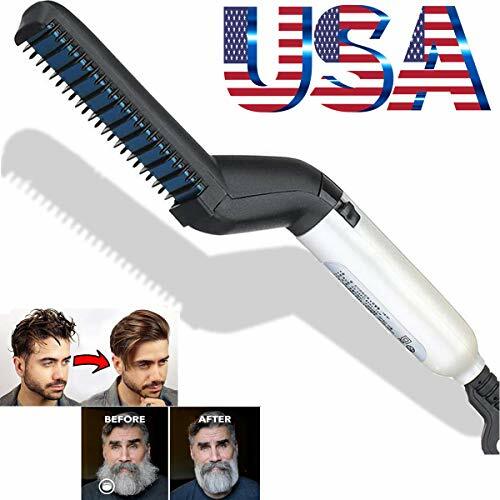 It’s not a hot air brush, and it’s not ideal for thick hair, but it’s still an excellent brush you would be well worth considering the next time you’re looking for an upgrade. Even though you can’t use this hot air brush when your hair is wet, which significantly limits its convenience, you are still going to find this product is leagues ahead of its competition for many reasons. What it does is take three products – a curler, brush, and straightener, combining it into one, convenient unit. The result is this MHU Professional hot air brush that continues to be a suitable addition to many people’s homes. It uses tourmaline ceramic technology to provide your hair with a frizz-free, shiny finish every time, and also has a digital display. As a result, you can control the temperature and settings to suit your needs. This hot air brush also has a key lock on and off button, an automatic shut-off function, and a quality PTC heater. However, the benefits don’t end there. Rather than putting up with the annoying and pesky hot air brush cord winding around the unit, you can benefit from a 360-degree swivel cord. No matter how many times you turn your brush, the cord remains in the same place. The bristles are also gentle on your scalp, it’s comfortable to hold, and it won’t cost you the earth, either! Many people are put off by its inability to dry your hair from wet, but isn’t having a straightener, brush, and curler in one enough to grab your attention and cater to your needs? You may find this hot air brush cuts minutes off your styling every day. When you spend hours in front of the mirror every week preparing your hair for the day ahead, you may begin to wonder whether there is a more natural way. If you buy a hot air brush, you may find there is. However, how do you know which one is going to tick all the boxes and have your hair looking its best? You don’t. You have to consider these points to have a better chance of making a confident purchasing decision. When you’re on the hunt for a new hot air brush, you need to consider your hair type. Is it thin or thick? Is it short, medium, or long? Some hot air brushes are more suitable for different hair types. For example, most of them on the market cater to those with short to medium-length hair of medium thickness. Read the manufacturer’s description to make sure it’s compatible. In most cases, the less you spend, the fewer features you will get. For some people, this will matter and, for others, it won’t. Before you go shopping, have a budget in mind. The best way to make sure you get the best bang for your buck is by comparing the features of the product to their asking price. Then, pay attention to customer reviews. Are they happy with the price in relation to the highlights? Remember, too; not everyone is satisfied after buying the most expensive hot air brush. When you buy a hot air brush, you will be using it every day in most situations. Therefore, the handle comfort is essential. Why would you use a product that’s not comfortable? Make sure the brush you are looking at has an ergonomic handle, premium grip, and isn’t thick or chunky. Then, check the weight of the head. If it’s too heavy, the head puts a lot of pressure on your hand and the handle which can result in an uncomfortable styling experience. The settings for each hot air brush can vary, depending on the make, model, and manufacturer. Some brushes enable you to choose from heat settings and temperatures, as well as a cooling temperature. Others, however, only have a high and low setting – or none at all. Doing your research is essential. The last thing you want to do is feel like you have no control over the heat of your appliance – potentially causing hair damage. Finally, technology plays a significant role. Without technology, every brush through with a hot air brush will be like creating straw in your hair. There’s a reason many brushes use ceramic barrels, ionic technology, and tourmaline. It helps your hair. You need to focus on getting the best and most recent technology. By doing so, you are increasing your chances of getting shiny, smooth, and easy-to-style hair that looks and feels stunning.